Sustainability is an increasingly important global goal. Having a set of globally recognised guidelines, or indicators, helps countries move towards this goal by assessing where they currently stand. The World Bank’s Regulatory Indicators of Sustainable Energy (RISE) is one of those assessments that scores countries based on their sustainable practices. 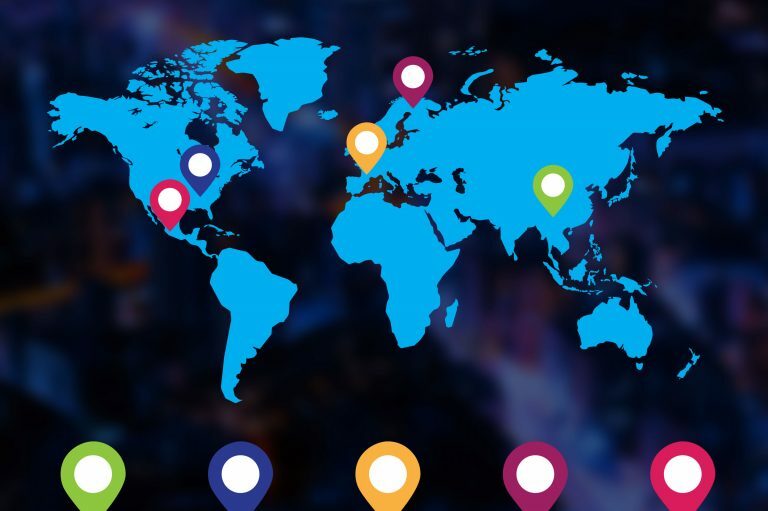 With 27 indicator elements covering 111 countries, RISE provides us a useful tool to benchmark and cross-reference national policies and regulatory frameworks designed to support sustainability across the world. Here are some key economies and indicators that show how Malaysia is performing overall. 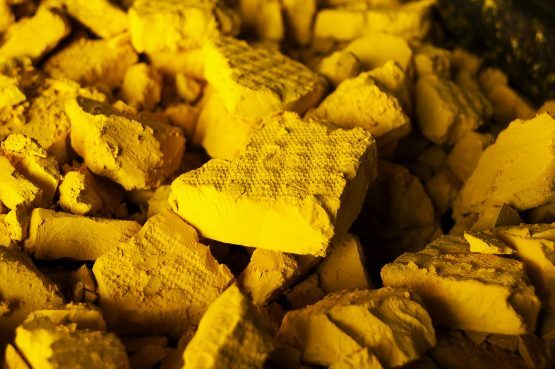 Energy Access explores how electricity supply frameworks are supported by regulation. 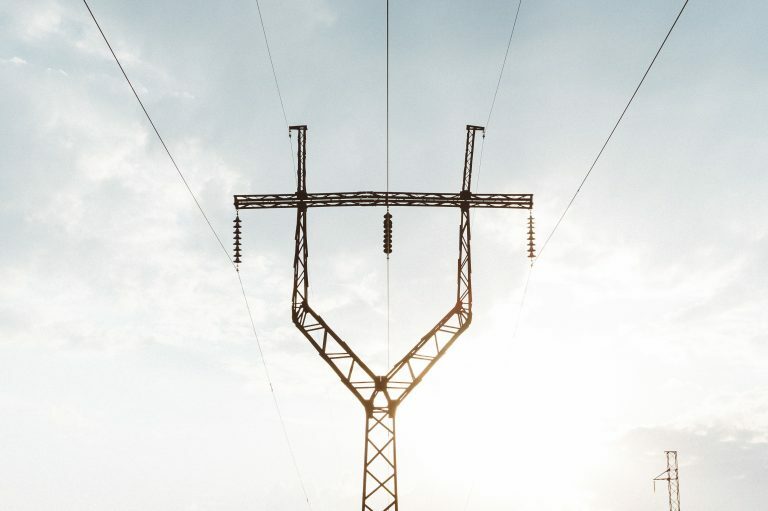 This includes key elements like a national electrification plan, alongside regulatory supports for grid infrastructure, cost of consumption, and stability of national utilities. 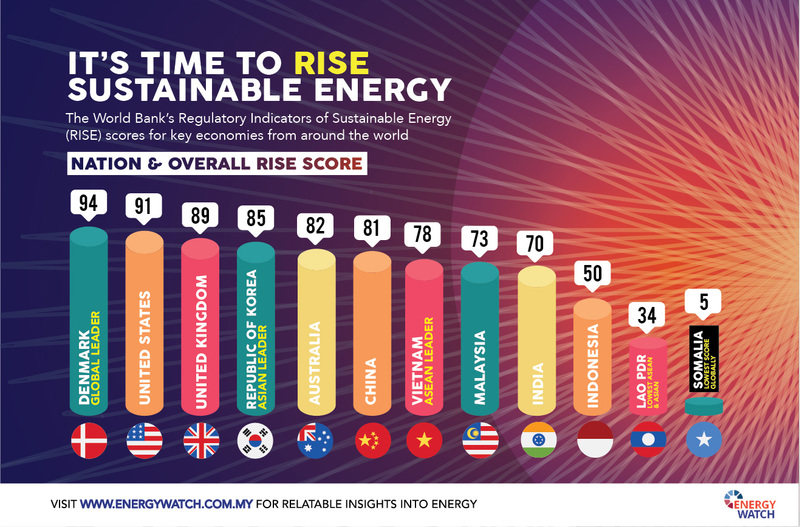 Malaysia is one of the countries who achieved a score of 100 on this indicator, celebrating regulatory frameworks that support sustainable, accessible, and affordable energy to all. Renewable energy plays a significant role in delivering sustainable, low-carbon power to a country. The Renewable Energy indicator explores the regulatory framework surrounding these technologies, from legislative supports to financial and regulatory incentives. Here, Malaysia scored less, but still within the upper third percentile. 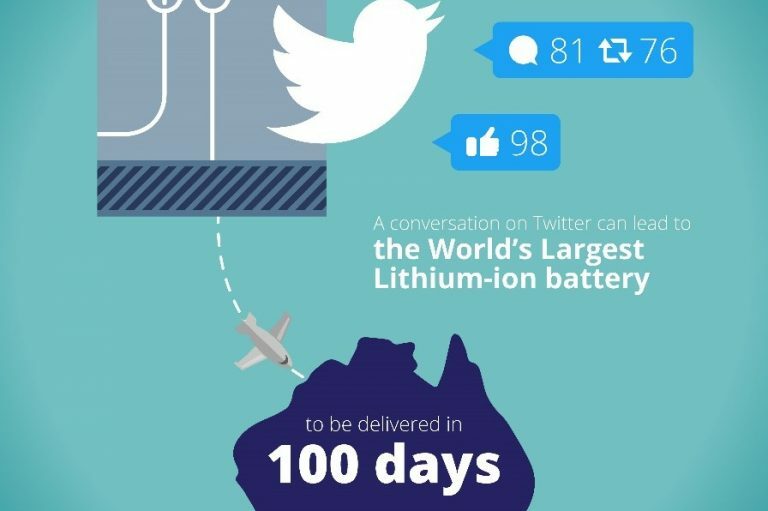 With a score of 68, the country was brought down by a lack of carbon pricing and monitoring, and poor network connection and pricing. Building a sustainable future is about being more efficient with the resources we’ve got. 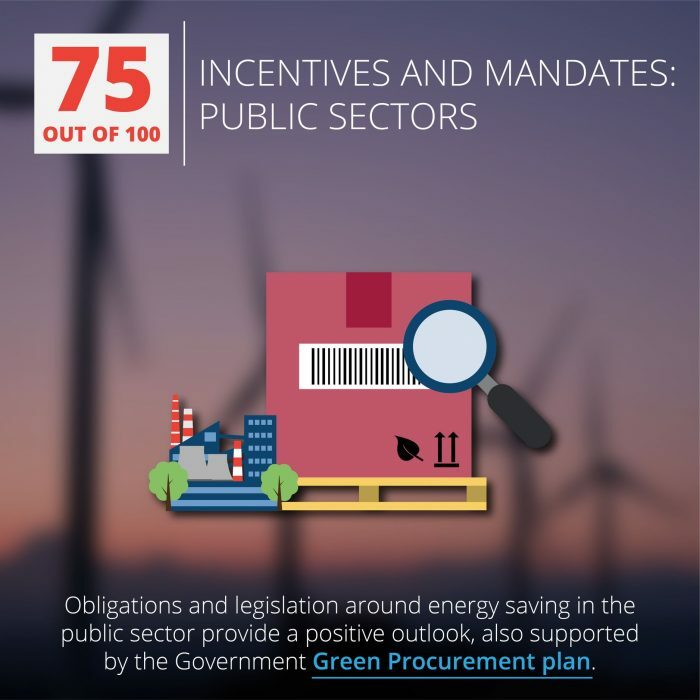 The Energy Efficiency measure assesses regulatory frameworks that support positive efforts to improve energy efficiency. Malaysia unfortunately scored below average with 52 marks, signalling room for improvement for this very important segment. 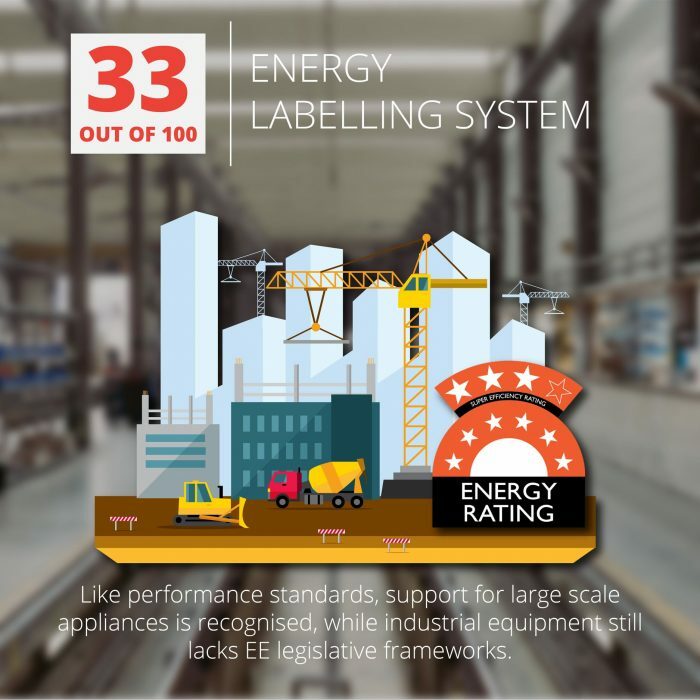 Energy Efficiency is the indicator where Malaysia receives its lowest score. 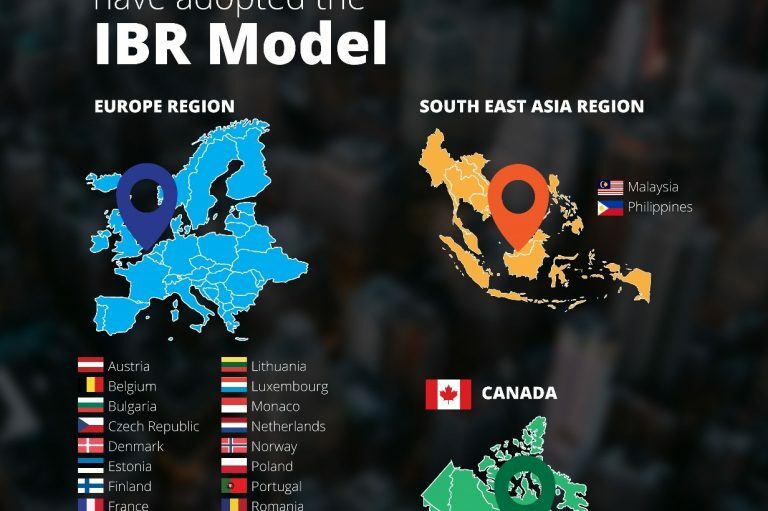 While the results reveal Malaysia continues to outperform similar growing economies such as Indonesia, the RISE indicators offer a positive case for the need to work towards greater support of energy efficiency as part of Malaysia’s sustainability goals. Here’s a breakdown of how energy efficiency sub-indicators contribute to the total, and how Malaysia is scored. 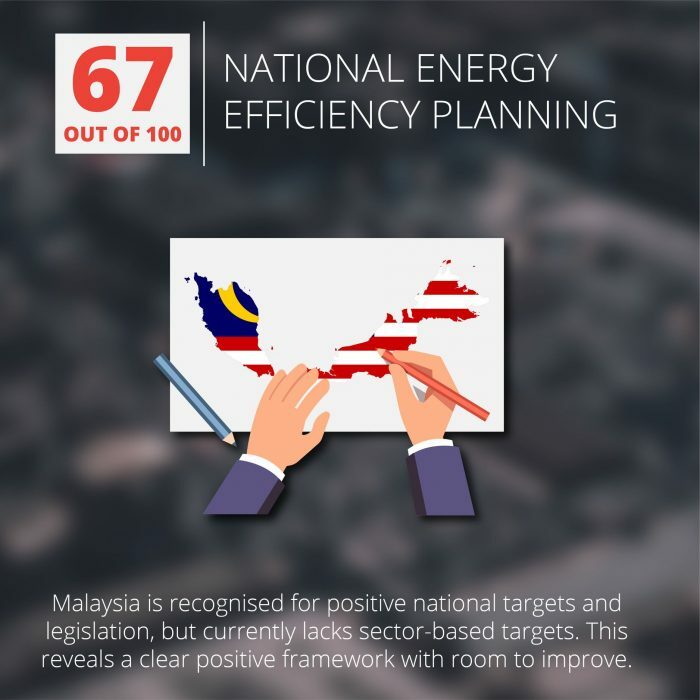 National energy efficiency planning: – 67 – Malaysia is recognised for positive national targets and legislation, but currently lacks sector-based targets. This reveals a clear positive framework with room to improve. 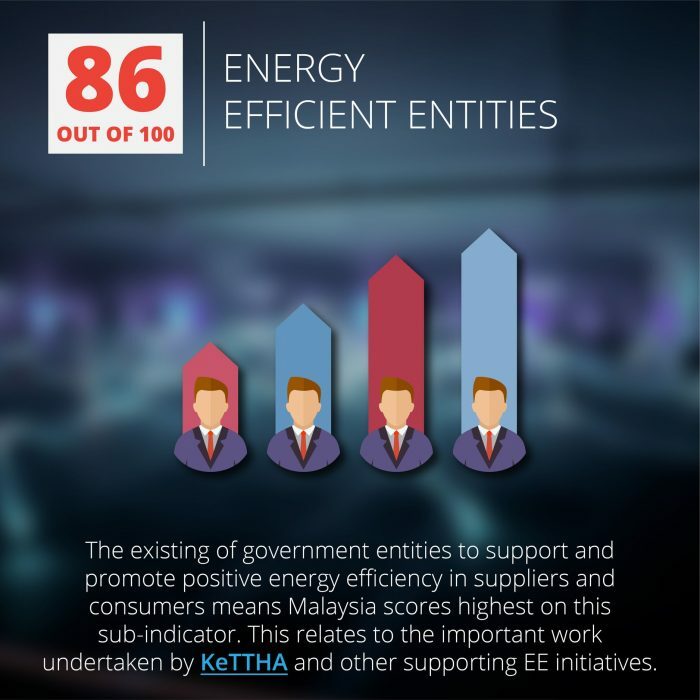 Energy efficient entities – 86 – The existing of government entities to support and promote positive energy efficiency in suppliers and consumers means Malaysia scores highest on this sub-indicator. This relates to the important work undertaken by KeTTHA and other supporting EE initiatives. 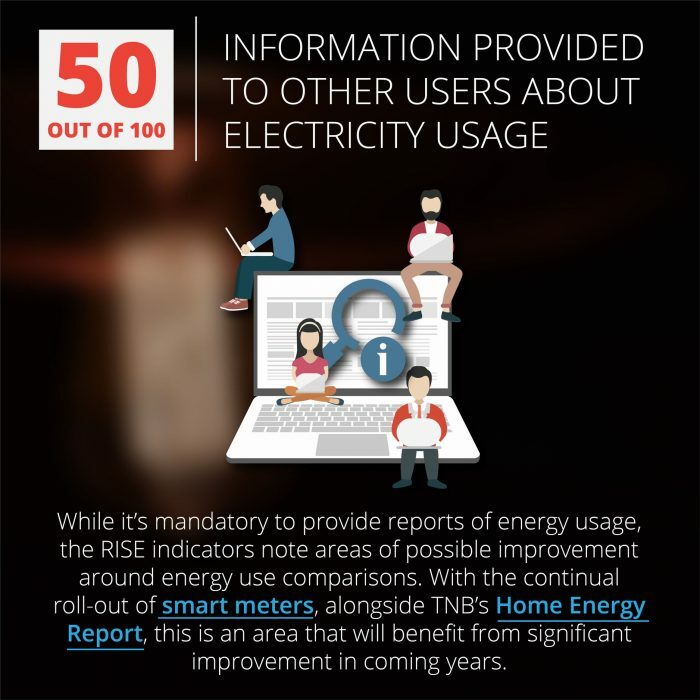 Information provided to other users about electricity usage – 50 – While it’s mandatory to provide reports of energy usage, the RISE indicators note areas of possible improvement around energy use comparisons. With the continual roll-out of smart meters, alongside TNB’s Home Energy Report, this is an area that will benefit from significant improvement in coming years. 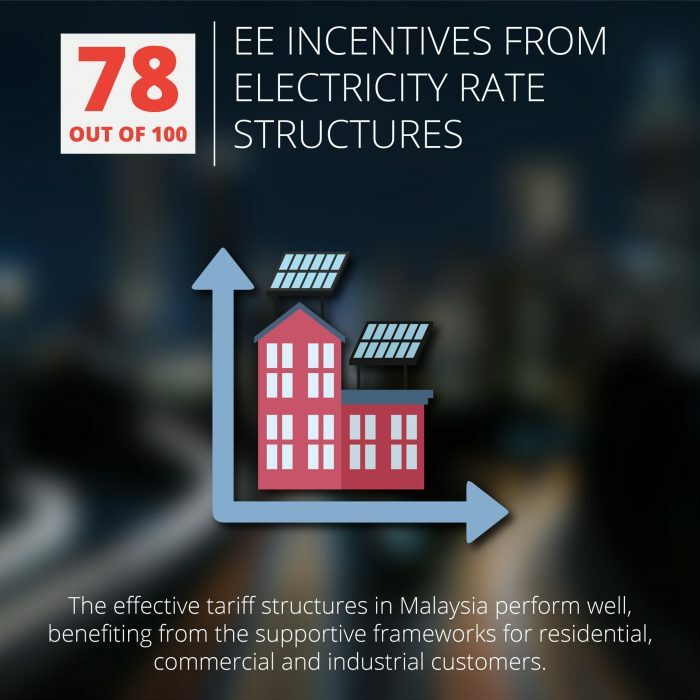 EE incentives from electricity rate structures – 78 – The effective tariff structures in Malaysia perform well, benefiting from the supportive frameworks for residential, commercial and industrial customers. 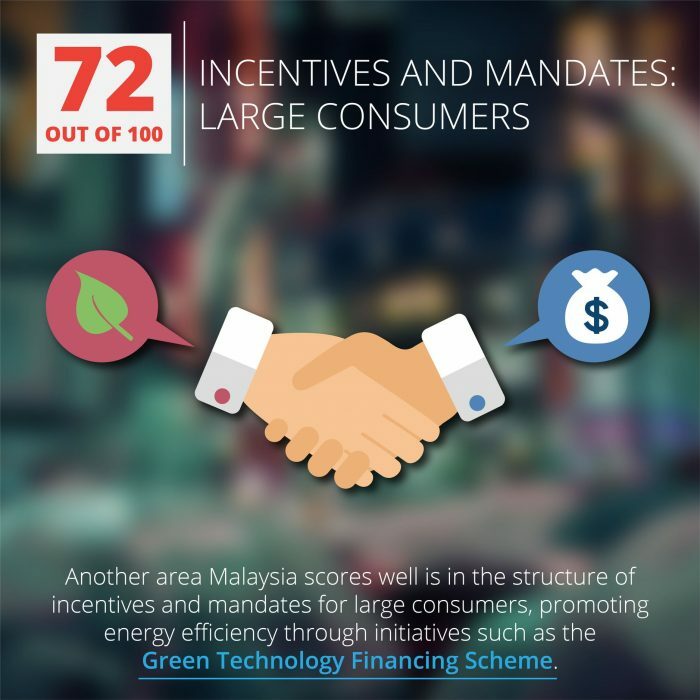 Incentives and mandates: large consumers: 72 – Another area Malaysia scores well is in the structure of incentives and mandates for large consumers, promoting energy efficiency through initiatives such as the Green Technology Financing Scheme. 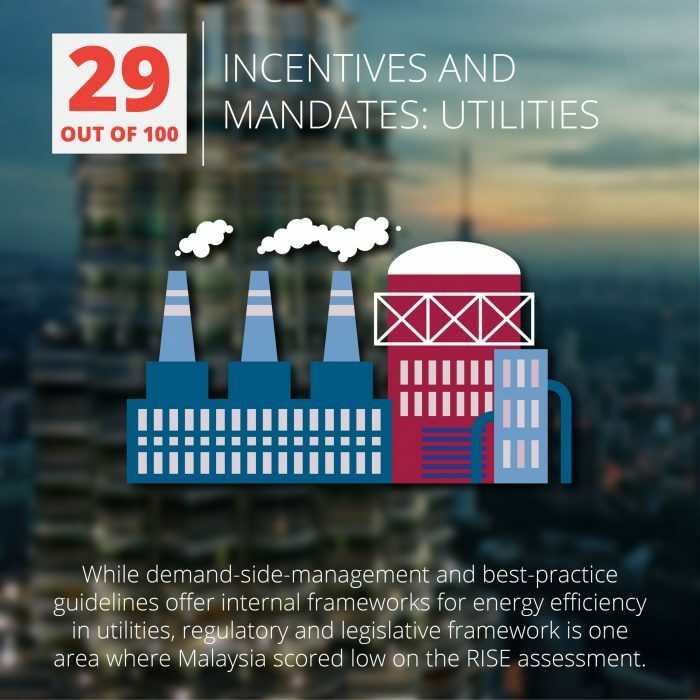 Incentives and mandates: utilities – 29 – While demand-side-management and best-practice guidelines offer internal frameworks for energy efficiency in utilities, regulatory and legislative framework is one area where Malaysia scored low on the RISE assessment. 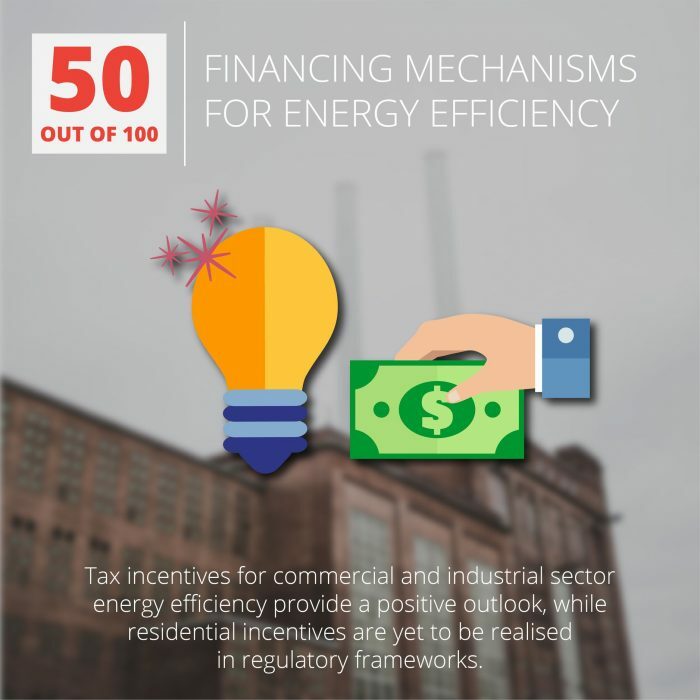 Financing mechanisms for energy efficiency – 50 – Tax incentives for commercial and industrial sector energy efficiency provide a positive outlook, while residential incentives are yet to be realised in regulatory frameworks. 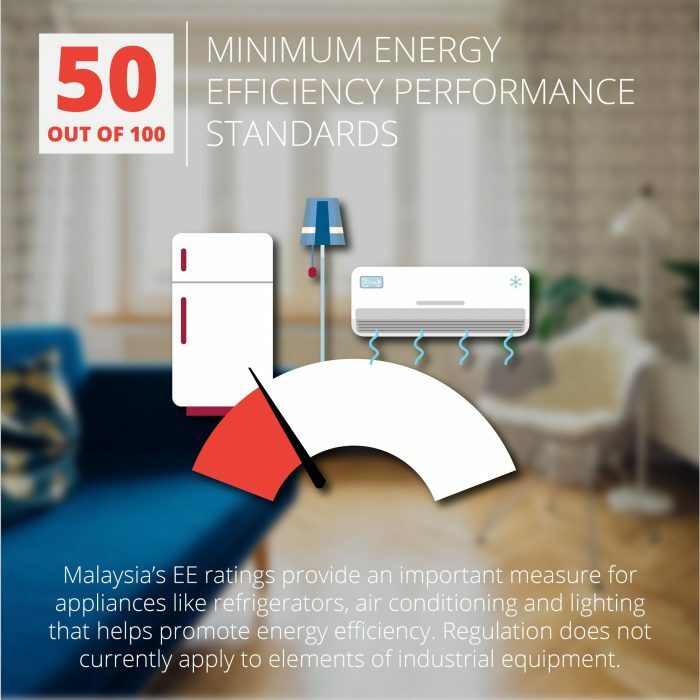 Minimum energy efficiency performance standards – 50 – Malaysia’s EE ratings provide an important measure for appliances like refrigerators, air conditioning and lighting that helps promote energy efficiency. 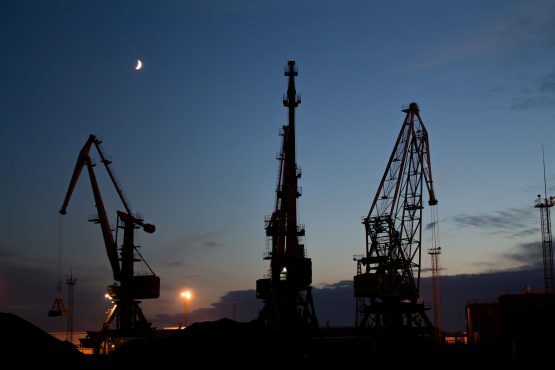 Regulation does not currently apply to elements of industrial equipment. Energy labelling system – 33 – Like performance standards, support for large scale appliances is recognised, while industrial equipment still lacks EE legislative frameworks. 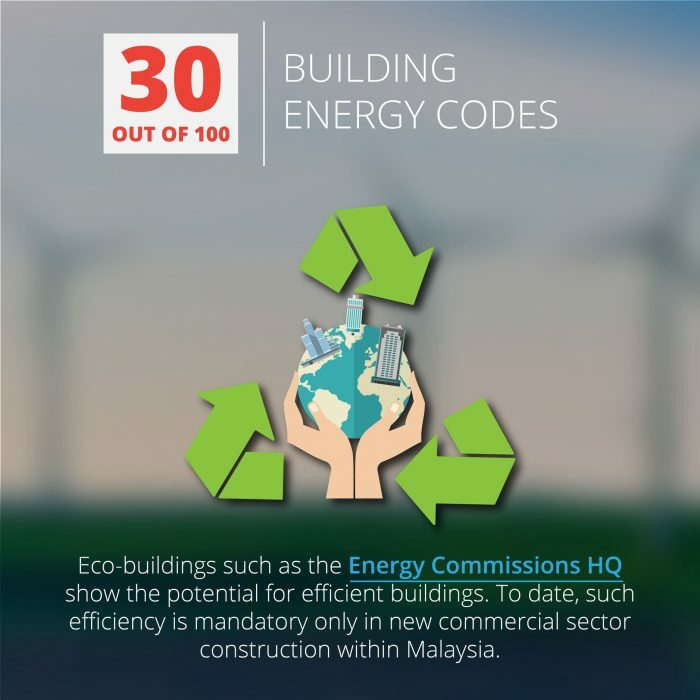 Building energy codes – 30 – Eco-buildings such as the Energy Commissions HQ show the potential for efficient buildings. To date, such efficiency is mandatory only in new commercial sector construction within Malaysia. 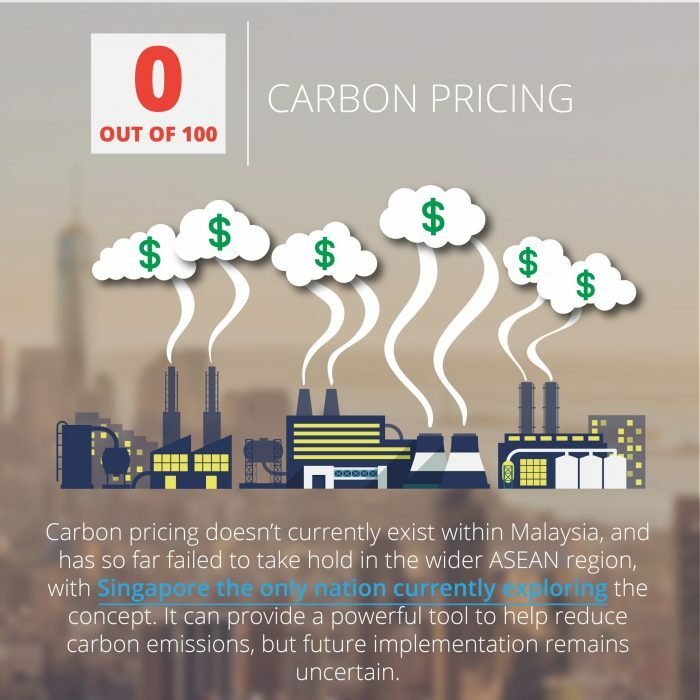 Carbon pricing – 0 – Carbon pricing doesn’t currently exist within Malaysia, and has so far failed to take hold in the wider ASEAN region, with Singapore the only nation currently exploring the concept. It can provide a powerful tool to help reduce carbon emissions, but future implementation remains uncertain. The Green Technology Masterplan Malaysia clearly sets out both the need for improved energy efficiency, and the goals which the nation must strive to achieve going forward. 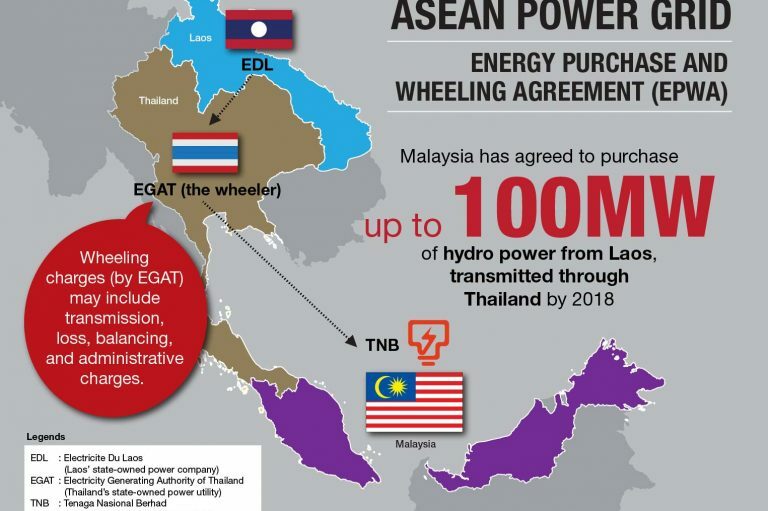 Under this plan, Malaysia aims to achieve a 10% reduction in electricity consumption through energy efficiency by 2025, and a 15% reduction by 2030. The RISE indicators show that overall, regulatory support for sustainability in Malaysia is performing well. It also provides a fascinating insight into the areas where the nation can look to improve. 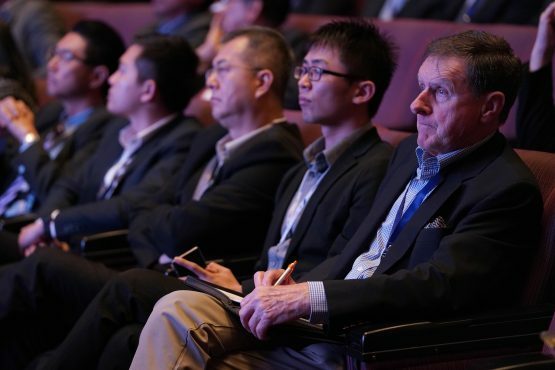 Energy efficiency offers an element of focus going forward, but we should all be certain that a focus on sustainable energy is not just good for Malaysia, it’s better for our world.